In a country with around 300 million smartphones, data usage per smartphone has increased to 9.6GB per month. While Internet penetration in rural areas is still low, those who do have access to Internet are benefiting from it writes Arshad Perwez. Some to even save their crop of onions. There is a silent change brewing across semi-urban/rural India, clearly visible even at an early stage of data adoption and usage in the country. As of September 2017, urban India, comprising around 32 per cent of the population, had 168 per cent mobile phone penetration. 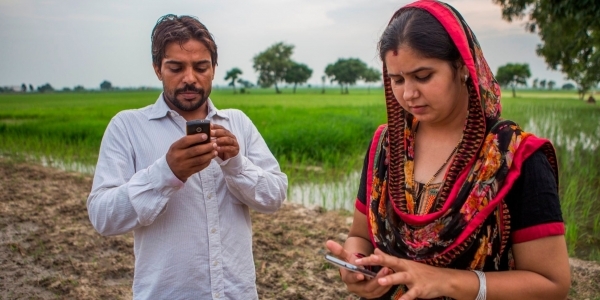 In rural India mobile penetration was at 57 per cent, essentially meaning that half of India’s rural population had a mobile voice connection by then. Internet access across India stood at 33 per cent in September 2017, with 16 per cent – 150 million people – in rural areas so far, indicating significant growth potential in the next few years. What this means is that the underlying changes are enabling “data democracy” or expanding internet usage across semi-urban and even rural India. While analysing the underlying socio-economic currents in the country’s 10-11 largest states, over a three-year period, there was an interesting case from the state of Madhya Pradesh (MP) that clearly highlights how rural economy can benefit over the next few years, aided by increasing data availability and its usage. This was in Sehore district, 50 km away from Madhya Pradesh’s state capital Bhopal. MP is among India’s largest states in the Central region and relies heavily on agriculture, which accounts for more than a fourth of the state GDP). Soyabean (oilseeds), pulses and wheat are key crops in this region, and over the past few years, farmers have increased sowing of vegetables including onions. Vegetables have a higher potential for profitability over regular crops. The net income/acre ranges from Rs 5,000-15,000 per acre for most cereals or pulses in this region, while onion cultivation can provide average of Rs 40,000-50,000 per acre and in a good period can go up to even upwards of Rs 100,000 per acre. The returns from onions can be exponential, as once fixed costs have been recovered, profits can be rather sharp. For example, in a normal year, if the productivity is 100 quintal per acre (1 quintal (ql) = 100 kg), a farmer will be able to break even at Rs 400 per ql (given a fixed investment of Rs 40,000) and every additional Rs 1 per kg or Rs 100/qtl raise in prices could mean a benefit of Rs 10,000 per acre for the farmer! However, a key challenge for farmers is the extremely high volatility in onion prices during the year. Usually, prices rise only for 2-3 months in a year; this is when a farmer can make a good profit. And there are other times when he ends up losing his fixed costs too. Note that onion is a non-MSP crop, so there is no assurance of procurement by the Government, leading to sharp volatility in pricing. 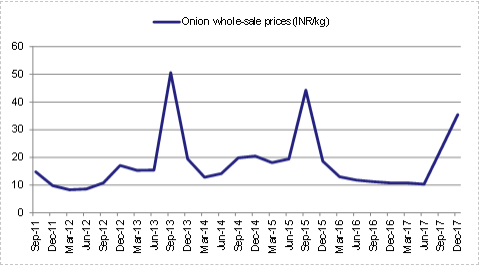 The chart below indicates the variability in onion pricing (wholesale, average across India), with the range between Rs 8-50 per kg (6 times). These are the wholesale rates, and many a times, smaller farmers receive around 50 per cent of these rates, as we found out while visiting rural India. Hence, as the chart indicates, there are few periods (September 2013, September 2015, December 2017) where the prices had risen sharply and those farmers with stocks could have gained disproportionately. Given the price fluctuations, adequate storage of onions becomes essential for a farmer to break even and/or make a profit. However, India lags significantly in terms of cold storage for horticulture (35 million tonnes of cold storage against production of around 300 million tonnes of horticulture in 2017) or less than 15 per cent of the horticulture crop can be stored at present), and is in the process of scaling up. Farmers are constantly forced to figure out storage methods on their own. Traditionally, farmers could store onions in a saleable condition for only 2-3 months in Sehore. They had heard that using ventilation and fans in a particular manner increased the storage duration to 8-9 months. However, they could not implement the solution without visualising the details. In 2017 came improved mobile broadband. Some wealthy farmers in the village who purchased mobile broadband connections watched video tutorials to learn how they could implement the storage solution for onions. They learned that installing exhaust fans and iron nets in the storage room could increase the life of their harvested crop by six months. The cost was only Rs 3,000 for one room that can store 200 ql of onions, which translated to around Rs 1,60,000 in value. In this village in Sehore too, soon after one farmer implemented this solution, several others followed. Interestingly, farmers are becoming more technologically savvy and aware. They often use voice recognition features on smartphones, asking Siri/Google assistant and the like for solutions to everyday problems ranging from food recipes to increasing crop productivity. As we travel through these villages again in 2018, I am sure we will see many more solutions that farmers and rural population have brought to their daily lives. Arshad Perwez is an equity research analyst at JM Financial, Mumbai (www.jmfl.com) and focuses on economy and policy research. He has travelled extensively in rural India as part of the Rural Safari series. He studied at the Indian Institute of Management, Ahmedabad and the Indian Institute of Technology, Varanasi. Excellent work ; providing the glimpses of the churning taking place in the rural India. Excellent uses of the Technology. Very good uses of the information of the utube!!! Very good article. Makes us thinks of things beyond e-commerce and the like, which are largely urban plays.